Eugene Fudge departed this life on Monday, September 17, 2018 at Robert Wood Johnson University Hospital in New Brunswick, New Jersey at the age of 90 surrounded by his family. “Gene”, as he was affectionately known, was born in Buena Vista, Georgia receiving his education in the Buena Vista school system. He was the eighth of twelve children born to the late Eugene and Essie Fudge. He was employed as a Machine Operator by Hyatt Roller Bearing in Clark, New Jersey, a division of General Motors Corporation. He retired in 1981 after 35 years of service. He was a member of the United Auto Workers Local #736. Gene was a member and former Chairman of the Trustee Board of St. Marks A.M.E. Church. He enjoyed playing in the church bowling league. 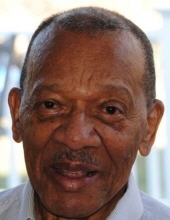 He was an active member of Concerned “R” We, Inc. and a life member of the NAACP. He had a love of all sports especially teams outside of New York. He will be remembered by his even temperament and kind spirit and he enjoyed spending time with his family and friends. On July 17th, 1954, Eugene married the love of his life the late Carol Hardy at St. Marks A.M.E Church in Cranford, New Jersey. Eugene was predeceased by his parents, Essie and Eugene Fudge; his beloved wife of 60 years, Carol Hardy Fudge; siblings, Howard, Wesley, Caesar, Edward and Elizabeth Fudge, Katherine Sutton, Georgia Russell, Addie Black, Jennie Taylor, Flossie Stewart and a sister-in-law, Jean Grice. He leaves to mourn, a sister, Ernestine Stewart of Georgia; sisters-in-law, Rose Fudge of North Carolina, Thelma Williams and Marjorie Reaves of Cranford, NJ and a brother-in-law, John Grice of Cranford, NJ; a special friend, Donna Tuttle and a host of nieces, nephews, cousins, other relatives and friends. To send flowers or a remembrance gift to the family of Eugene Fudge, please visit our Tribute Store. "Email Address" would like to share the life celebration of Eugene Fudge. Click on the "link" to go to share a favorite memory or leave a condolence message for the family.